The idea for the Nebula class was just before Easter 2013th. On and off I put my models on the part of the Star Trek Round Table. This time it was my Miranda class. The contact with the Round Table is rarely without consequences. Sometimes it’s a conversation, sometimes just the atmosphere that encourage me to design new models. This time it was a casual comment that Turon47 one of the members of the Round Table placed on my post to the Miranda class. He only noticed that the Constitution and Miranda class star ships were similar to each other like the Galaxy and Nebula class and then asked if I had ever thought, to fold on the basis of my Miranda or Galaxy Class model the Nebula class. The idea took hold of me and had no rest for several days. In fact, I once created a draft of the Nebula class long ago, but I didn’t like this put it away and finally forgot how to do it. I had to start again from scratch. In the reminder that my previous attempts based on crane simply were not successful, I began by experimenting with the Miranda class as basic figure. 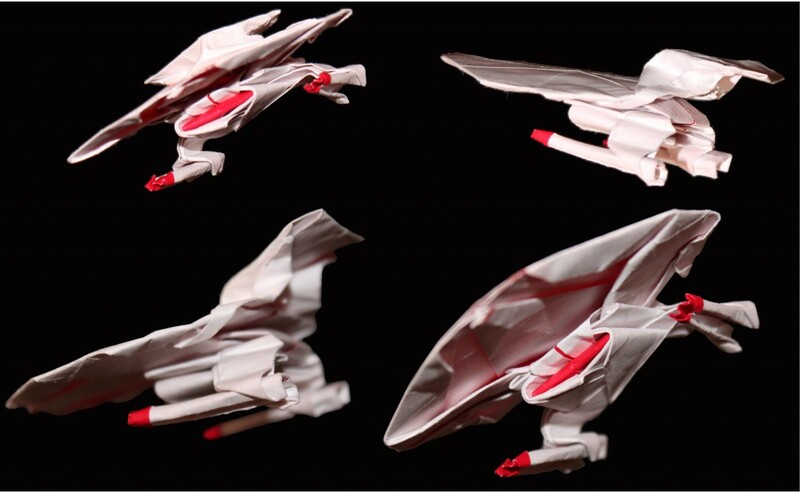 I noticed quickly that the Miranda class as origami model above provides just enough material to fold a small turret or extends a thin spoiler, for larger weapons or sensor phalanx bowl it does not. The Miranda class as basis was eliminated and so I started again with the crane base form. Slowly, I have a clear recollection of why I threw away my previous attempts to create nabula class modellbased on the crane. A single variation was quite recognizable, and therefore perhaps more bearable, but it was too vague. .. and rejected my model immediately as wholly inadequate. The consummation was that both the nacelles and the turret upside hzas wrong orientation. That left the ship still remain recognizable but was for me not acceptable. 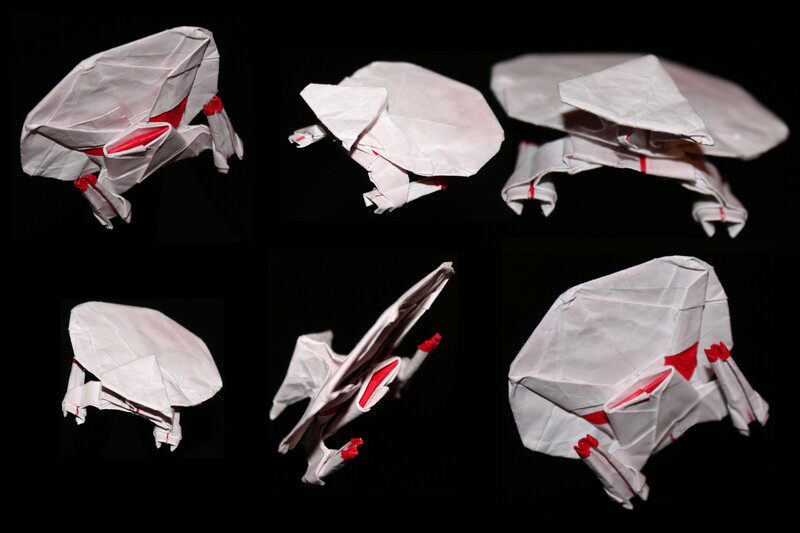 Eventually I gave up my attempts to fold the model from a piece of paper. 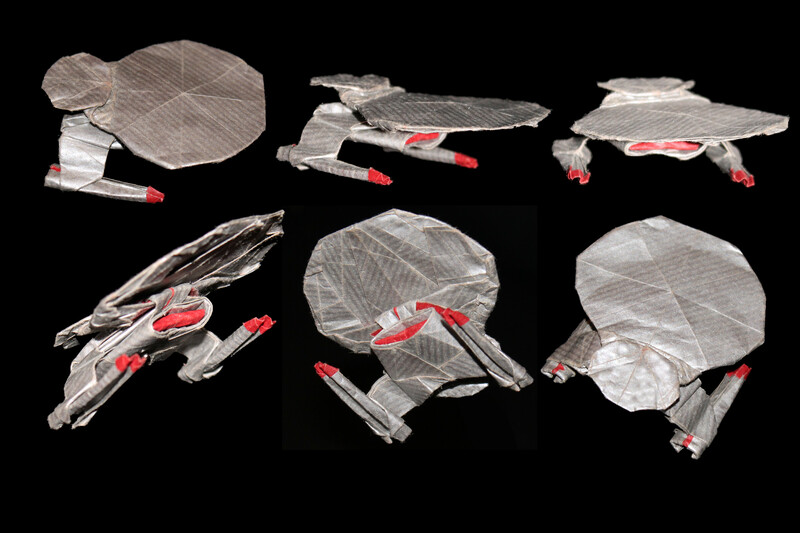 So I decided to try the modelling of this ship as modular origami which would be based on the model of the Enterprise. After intense work by the end of the day I had two versions. This model is developed from two equal squares. The saucer has the same basic shape as the enterprise was, but rotated by 45 °. The form is symmetric, but has many overlapping parts. 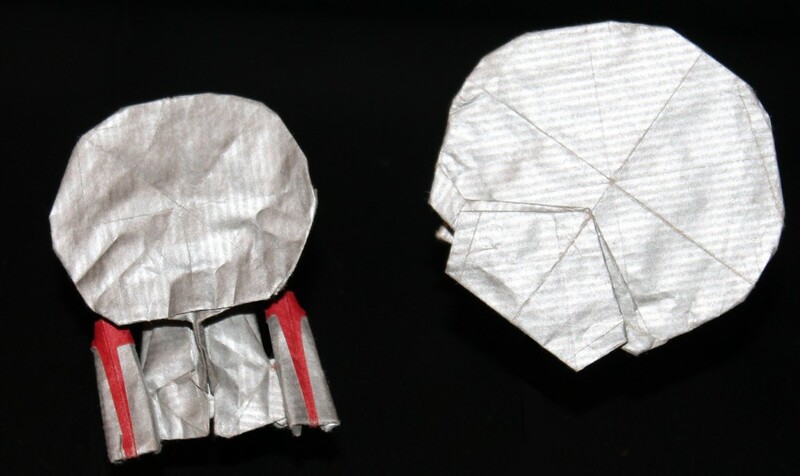 This resulted in difficulties by designing of the weapon tower and bag to connect to the machine section, so the saucer did end up looking quite wrinkled. For this, I tried to pick another basic shape for the saucer. This should have fewer overlapping parts. Although I managed it, but I soon realized that the saucer, if it made of the paper of the same size as I used for the machine section was too big. I changed the proportions and I already had a very nice version of the Nebula class. I’ve rejected the second version as well. Despite her quite clean folding the relative sizes of saucers and the machine sections were still wrong. So I went back to the first version. 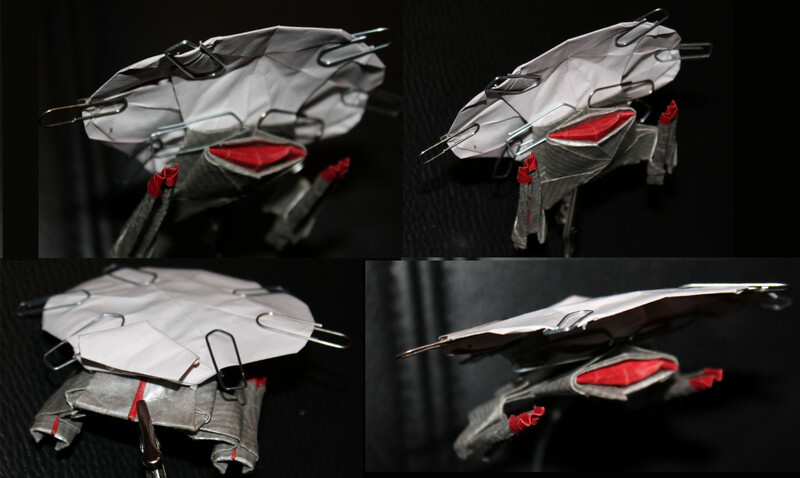 The problem with it was dirty folds due to many overlaps on the inside sides of the saucer. After much thought, I decided that the cleanliness of the fold and overlap is actually in my hand. I was convinced that I can not only avoid the overlap at critical, but also use them where it occurs to my advantage in order to bring a bit of volume in the saucer. Suddenly, I knew exactly what to do. No step was random, I saw reference points and lines in places where I didn’t yesterday. The result was the connection between the saucer section and the machine became even more tightly than in the Enterprise and even the weapon phalanx had right size and position. The model could now fold mostly dry and needed only a little wet at the end. The Nebula class had long been finished. 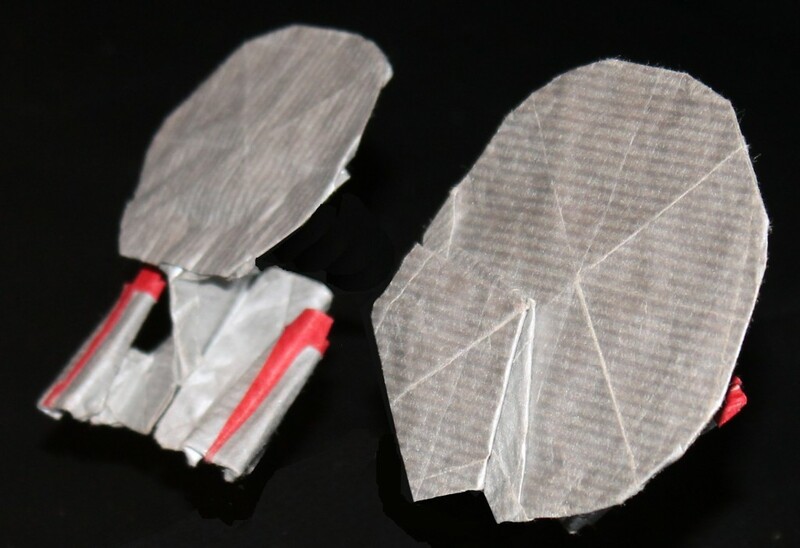 I built from the third version of a piece of red / silver paper and wanted to photograph the contents of this when I noticed that the proportions are not quite right still. 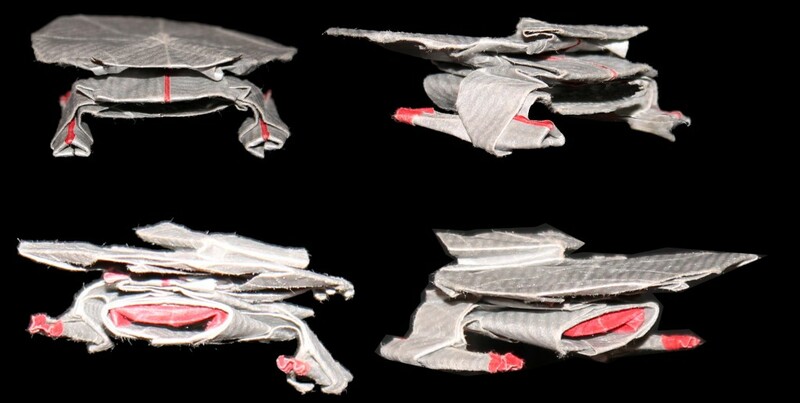 The Nebula was to consist of the components of the Enterprise, only a little more compact without saucer neck. But this means in particular that it can be greater in than the Enterprise. And she was clearly too large. And no matter how I have tried to put together, it did not help. She was almost as large as the entire enterprise. The saucer had gotten huge, so huge that it is now almost completely covered the warp nacelles. I had to shrink the saucer. The best way for this is to return to the same proportions as they exist in the Enterprise. The little probelem was that I had to do this without losing the stretched shape of the saucer and needed still enough material to model the weapons phalanx. In short, it took me an extra day, but now is the fourth version ready. 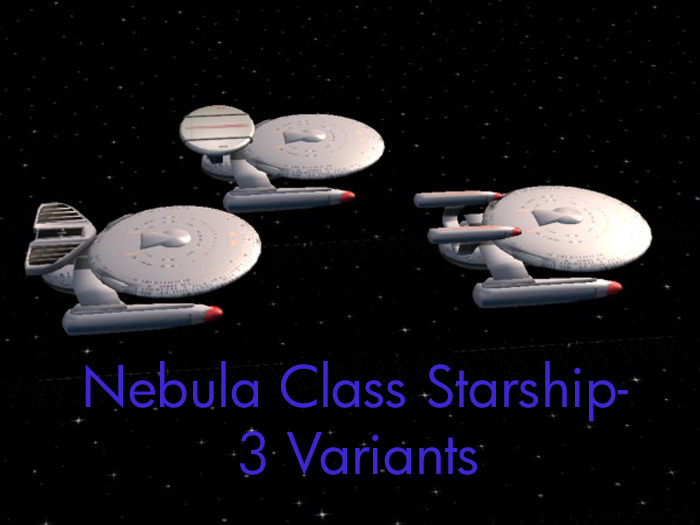 As I learned from Turon47 there are three different versions of the Nebula class. The presented already by the Phalanx weapons, with a sensor array, and with two additional Warpgandeln.